Chocolate chip rice krispie treats. I grew up with this tasty tradition, which was passed on by my father's family. One of my dad's favorite childhood Christmas memories is this simple, delicious treat that his dad would make, always with chocolate chips. My grandfather had a bit of a sweet tooth and he's passed that along as well. 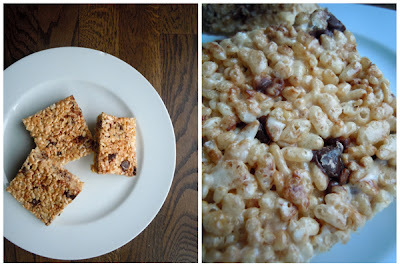 I also make the original rice krispie treats because a few of my man clan are not a fan of my vegan chocolate - too dark for them. So the nice mama I am, I offer both to suit their fancy. Yummo!! I need to do some Christmas baking!